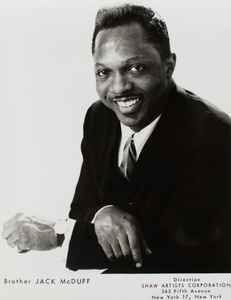 American jazz organist and band leader, born 17 September 1926, Champaign, Illinois, U.S.A., died 23 January 2001, Minneapolis, Minnesota, U.S.A.
Jack McDuff was a talented bandleader and organist with the Hammond B-3. He started his career in the 50s working with piano and organ. In 60s created his band with Harold Vick and drummer Joe Dukes and then hired a young guitarist called George Benson. He published a lot of albums with famous jazz labels like Blue Note or Prestige. During the 80s he played electronic keyboards and plublished his music for Sugarhill records, a famous record label owned by the soul singer Sylvia Robinson (well-known for the Sugarhill Gang and Rapper's delight, the 1st million-dollar rap hit).